Pollution Prevention and Energy Efficiency (P2E2) Roundtable Meeting at Walmart Distribution Center, Tobyhanna, Monroe County. On August 20th the Pennsylvania Association of Environmental Professionals (PAEP) P2E2 Roundtable held its quarterly meeting at the Walmart distribution center in Monroe County. The topic focused on the robust sustainability practices including recycling and energy efficiency of the world’s largest retailer. The company provided a presentation and on-site tour where they explained that over 90% of the waste generated within the facility is recycled. Walmart has “sustainability stations” strategically placed throughout the building. The company has over 17 miles of automated conveyors that ship over 300,000 cases of freight each day to Walmart stores in four states. The site consists of a 200 acre campus that includes the main distribution center building, which encompasses 1,250,000 square feet of floor space (30 acres under roof). Also housed on the campus is a truck maintenance garage, pump house, waste water treatment plant, and parking for over 2000 trailers. New members of the Roundtable were welcomed and two have asked to join the Steering Committee. The new members asked many questions to Walmart’s senior management team. More information on Walmart’s sustainability program that focuses on energy, waste, and sustainable products can be found here. Join us and see how Ultra-Poly recovers value from materials that are difficult or even previously impossible to process. Their operations have the potential to save significant natural resources and change recycling in America. Come join your fellow PAEP members at Knute’s Pub in Shippensburg, PA to learn about Shippensburg University’s Center for Land Use and Sustainability (CLUS) and hear about some of the exciting projects with which the CLUS is involved. Social networking and Business Card Drawing will be from 5:30-6:00 PM with the presentation from 6:00 to 7:00 pm. There will be no registration fee for the event; however, a head count is needed in advance to provide to the meeting location and to coordinate potential carpooling. Please RSVP to JT Graupensperger @ moc.inonnepnull@regrepsnepuargj or 717-620-5922 by Thursday, April 7, 2016. You are cordially invited to participate in the Pennsylvania Association of Environmental Professionals Annual Conference at Toftrees Resort, in State College Pennsylvania. Conference sessions and speakers will cover many subjects relevant to today’s issues, including an update to the FAST ACT, FERC process and regulations, energy independence, wetlands and streams impacts and mitigation, land recycling, public involvement in low income communities, an update tot he PA Conservation Explorer tool, regulatory permitting information, new PennDOT initiatives and mitigation for historic bridges. Our keynote address will be made by PA DCNR State Secretary Cindy Dunn, a PAEP Karl Mason awardee. Ms. Dunn has been a supporter of PAEP, and we are pleasedshe can be here to update our members on the path DCNR is taking to protect Pennsylvania’s natural resources as well as discuss new DCNR programs. When there are unavoidable impacts to wetlands, streams and endangered species habitats, those projects may be required to mitigate for the impacts to those natural resources. Whether this is a stand alone project on a single site or a linear project involving miles of potential impacts, planning for mitigation is an important task for the Environmental Professional, Resource Manager and Project Owner. At our 2016 PAEP Annual Conference members of Resource Environmental Solutions (www.res.us) gave a great presentation on wetland and stream mitigation strategies, as well as the use of species/conservation habitat banking. Although Wetland Banking has been in existence for a long time and is the preferred mitigation strategy, banking use in eastern Pennsylvania is very limited. Both PennDOT and RES have successfully been using banking in central and western Pennsylvania for several years. Conor Gillespie and Jonathan Kasitz of RES will explain some of the available strategies that can be used to mitigate for unavoidable project impacts using a watershed approach, including the integration of wetland, stream and species mitigation. We are sorry but space is limited to 50 people! The PADEP Office is also conveniently located near public transportation facilities: SEPTA High Speed Line and Manayunk/Norristown Regional Line. RSVP: Mike Parrent (lim.liamnull@vic.tnerraP.L.leahciM Use “P2/E2 meeting” in the subject line. Please provide your name, title, business name, and phone number. Please wear comfortable clothes and shoes as we will be walking for the tour! Required: Attendees must be 18 years or older, no smoking, and no photographs allowed. Kent will give an overview of the new PA Conservation Explorer, an online tool for conservation planning and PNDI environmental review. Participants will learn about the tool’s capabilities and how it has changed from the previous PNDI Environmental Review Tool. The presentation will be followed by a question and answer session to help current users learn more about specific topics and issues. Lunch will Consist of subs, fruit and various sides. RSVP attendance to Sarah Lavin at sml104@pitt.edu, and have cash/check payable at door. We will also be selling raffle tickets for a chance to win a beautiful wall art piece donated by one of our members. All proceeds will go towards our PAEP scholarship program. The Fort Washington business park and interchange of the Pennsylvania Turnpike in Upper Dublin Township, Montgomery County has been subject to significant flooding problems for decades. To help this issue, Upper Dublin Township contracted URS (now AECOM) to design and build two new flood-retarding structures along tributaries to Rapp Run and Pine Run. This project involved an interdisciplinary team of professionals from Colorado, Virginia, Maryland, and Pennsylvania and was successfully permitted and built within 3 years. The challenges to obtain the first regulatory approvals for a new “dam” in Pennsylvania since 1985 from the U.S. Army Corps of Engineers, Pennsylvania Department of Environmental Protection, Division of Dam Safety, and Montgomery County Conservation District were discussed at PAEP’s annual conference in May 2016. Archeology, bog turtles, red-belly turtles, legacy sediment, visualization assessments, and the creation of a compensatory wetland mitigation site on a former soccer field were all components to creating structures that successfully control flood waters without adversely impacting the surrounding environment. Come see the structures and wetland mitigation sites in person and hear a synopsis of the project! We are sorry but space is limited to 25 people! The PASPGP program is a general Section 404 permit issued under the federal Clean Water Act by the Corps on a Pennsylvania‐wide basis for activities that would cause no more than minimal adverse environmental effects. Jared will give a presentation outlining the significant changes made to the program within the newly enacted PASPGP‐5. Lunch will consist of assorted subs and various sides. RSVP attendance to Sarah Lavin at ude.ttipnull@401lms, and have cash/check payable at door. NOTE: If you plan on attending the live webinar, you MUST register online. PAEP Pollution Prevention and Energy Efficiency Roundtable (P2E2) Meeting at Lutron World Headquarters, Coopersburg, Lehigh County. Energy efficiency is an essential element of every home and business. On November 10, 2016, the Pennsylvania Association of Environmental Professionals (PAEP) P2E2 Roundtable held its quarterly meeting at the Lutron World Headquarters Experience Center, Coopersburg, Lehigh County. Lutron has been providing energy-saving light control solutions for more than fifty years and offers solutions to reduce energy costs. The Experience Center allows visitors to see first-hand the demonstrated energy savings inherent with lighting control. Lutron offers dimmers, occupancy/ vacancy sensors, light control systems, and shading solutions to reduce lighting energy use, optimize system performance, and enhance the visual environment. Upper Saucon Township Wastewater Treatment Plant participated in the meeting and were encouraged to become energy ambassadors on their Pretreatment Information Exchange Group (a Lehigh Valley group of wastewater treatment plants that share experiences, successes and failures of pollution prevention initiatives in the industry). The treatment plant readily agreed. A lively discussion followed the tour which included state grant programs such as the High Performance Buildings and the Small Business Advantage Grant. Lutron is already researching the viability of the new DEP/DCED Solar Energy Program (SEP) loan program to install a system at their Coopersburg site. Lutron will join the PAEP and participate in future PAEP Annual Conferences and the P2E2 Roundtable. Lutron offered their site for future meetings of the PAEP P2E2 RT and invited the Roundtable back to tour their manufacturing operations! The next meeting of the PAEP P2E2 RT will be held in February 2017. Additional information on PAEP and the Roundtable can be found at www.paep.org. It’s back! Join us for a night of fun, food, and flowers at Phipps Conservatory. As a thank you to our members for making this year so great, we’d like to invite you and your family/friends to a tour of the Phipps’ Winter Flower Show and Light Garden. Café Phipps will provide free hors d’oeuvres for the event and a cash bar for drinks. Networking hour from 5:30 – 6:30 pm, tours start around 6:30 – 7:00 pm. Please join us as we celebrate the Winter Solstice at Central PA Networking Night at Midstate Distillery on December 21, 2016, from 5pm-7pm. The public in general and even many in the environmental consulting profession know little about the life history and current status of freshwater mussels. Perhaps all of us have walked by these inconspicuous inhabitants of the Delaware River watershed, thinking that what we are seeing in rivers and large streams are merely rocks and cobbles emerging from bottom substrates. Mussel species are diverse and their appearance when out of their native bottom habitat is quite colorful with many shapes and sizes. They have a very unique reproductive strategy. Some may believe freshwater mussels are related to marine and estuarine bivalve counterparts, but their life history and longevity are different. Mr. Joseph Snavely is a Principal Scientist with Normandeau Associates, Inc., based in Stowe, PA (Montgomery County). He is an expert aquatic ecologist and a US Fish and Wildlife Service qualified freshwater malacologist. Mr. Snavely is approved to survey threatened and endangered mussels in the Atlantic Slope and the Interior Basin, encompassing seventeen states. Joe will present to the group the general life history, diversity, and population range of mussels in our region, including the ecological function they fill, the regulations that govern them, an overview of an approved mussel survey plan and implications to various water users regarding their population numbers and other dynamics. We are sorry, but space is limited to 75 people! This event is only the beginning. Look for other interesting topics throughout the year! Certificates of Attendance will be provided at the conclusion of the presentation. Please mark your calendar now and plan to join PAEP in State College as we celebrate our 32nd Annual Conference. This year we heard your request to hold the conference earlier in the year. Please see the new dates below. It is a wonderful opportunity to meet colleagues, hear expert presentations, learn about new industry trends and policies, and enjoy some well-deserved fun! Click here if you need to download the conference brochure. Please join us at Duke’s Bar & Grill in Wormleysburg on Thursday, April 13, 2017 after the 11th Annual SWEP Making Environmental Connections Conference, from 4:30pm to 7:30pm, for an evening of networking with members from PAEP and SWEP. Appetizers will be provided. RSVP to JT Graupensperger suggested, but not required. Grind to Energy System in Selinsgrove. Use “P2/E2 meeting” in the subject line. Please provide your name, title, business name, and phone number. Required: Please wear comfortable clothes and shoes as we will be walking for the tour! Poly- and perfluoroalkyl substances (PFASs) are a class of emerging contaminants whose release in the environment has occurred from industrial and firefighting activities. 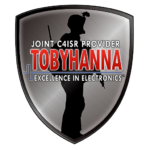 PFASs are used in a multitude of industrial and consumer products (electronics, aerospace/defense, building/construction, alternative energy, automotive, semiconductors, military, healthcare, outdoor apparel/equipment and chemical/pharmaceutical). Most notably PFASs are part of aqueous film forming foams (AFFF) used for fire training and firefighting. PFASs are a class of compounds with carbon-carbon chains of various lengths, varying degrees of fluorine saturation, and organic acid or sulfonate functional groups at one terminal end. Fluorine-carbon bonds are one of the strongest bonds in nature; therefore PFASs have distinct and unique properties of strength, durability, heat-resistance and chemical stability. These compounds are also highly soluble in water and persistent in the environment, and as a result PFAS plumes tend to be large, dilute, and represent potentially large financial and environmental risks. Environmental investigation and characterization for PFASs face numerous challenges, including the potential for cross-contamination during sampling and analysis, environmental ubiquity, the potential for multiple release modes and sources, and multiple transport pathways (air, water, soil and bedrock). In addition, limited remediation technologies are available. A discussion of these topics and information on potential for risk to human health and ecological receptors will be presented. This presentation will be made by Dr. Katherine Davis, Mr. James Fenstermacher, PE, and Dr. Sagar Thakali of AECOM. Dr. Davis, North America PFAS Lead for AECOM, is a Principal Geologist with over 15 years of experience working on a fluoropolymer manufacturing facility project in West Virginia. She previously was the AECOM PFAS Technical Practice Group Lead. Mr. Fenstermacher is a Remediation Technical Lead with over 28 years of experience, and is the PFAS Regional Lead for the North East Region. He is the portfolio-wide Program Technical Manager for a large, multi-national chemical manufacturing client, and has served in an advisory capacity on numerous complex remediation projects for this and other major clients within AECOM. Dr. Thakali is a Principal Risk Assessor for AECOM. The Saw Mill Run watershed has a history of flooding, water quality impairments, and poorly planned development. This session discusses how citizen engagement and stakeholder input are being used to inform a data-driven methodology for revitalizing the environmental, economic, and social health of this urban watershed and transforming the blighted main commercial corridor into a Green Boulevard. Topics include innovative property evaluation methodologies and digital applications to engage ‘citizen scientists’. Attendees will learn how these tools can be adapted to project needs and participate in a hands-on demonstration of the Water Reporter mobile application. Due to having to choose a meal selection please register each person individually not as a group. Eggplant Parmigiana – Breaded in Panko crumbs, lightly fried and topped with mozzarella, marinara and lemon buerre blanc. Come join your fellow PAEP members and get some exercise walking on the paved trail along the Yellow Breeches. Then we will walk over to Nick’s Café where Navarro & Wright Consulting Engineers will provide appetizers for the group. Beverages and other food will be on your own. In the event of heavy rain, we will omit the walk and just meet for happy hour at 5:15 pm. A head count is needed to estimate the space needed at Nick’s Café. Please RSVP to JT Graupensperger at moc.inonnepnull@regrepsnepuargj or 717-620-5922 by Thursday, June 15, 2017. New Cumberland Borough Park: 517 Front Street in New Cumberland. Nick’s Café: 114 Bridge St, New Cumberland (approx. 1500 feet northeast of the park). Park your vehicle at Nick’s or at the Borough Park. No Cost to attend. Appetizers provided. Contact Emily at moc.gnemtnnull@ttoznrebe with questions. Former PAEP President and loyal Western Section member, Eric Buncher of the Allegheny County Airport Authority, was the 2017 recipient of the PAEP Karl Mason Award! Come celebrate with us at Arsenal Lanes in Lawrenceville with free food, bowling, and shoe rentals, and spend the evening socializing with us and other local environmental professionals. Members and Non-members are both welcome! Cash bar available. Non-members who sign up for membership at the event get a free drink of choice on us! PAEP P2E2 Roundtable’s 20th Anniversary Celebration. The Pennsylvania Association of Environmental Professionals (PAEP) Pollution Prevention and Energy Efficiency (P2E2) Roundtable (RT) celebrated their 20th Anniversary (84th meeting) on September 21st at the Tobyhanna Army Depot (TYAD), Monroe County. The first meeting took place at TYAD in 1997. The RT returned to where it all began to thank everyone involved, including our DEP staff, for their years of support! The meeting and tour were also held in celebration of National Pollution Prevention Week! Presenters included TYAD, General Dynamics and the Eastern Pennsylvania Alliance for Clean Transportation (EP-ACT). TYAD is a RT founding member and co-chair and a leader in the sustainability movement in NE Pennsylvania and has launched several P2E2 projects as a direct result of their involvement with the RT. The Depot has also saved the government money by cutting back on energy consumption. Their 100,000 square foot green roof alone has cut energy expenses by 30%. Some of the Depot’s sustainability projects include solar tube lighting, green roof design, daylighting, energy efficient lighting technologies, electric vehicle fleets, solar powered lighting, LEED certified buildings, white roofs, ISO 14000 and process pollution prevention projects. General Dynamic’s Scranton facility is one of the founding members of the RT and one of the top five energy performers in the world since their implementation of ISO 50001. The meeting also offered EP-ACT’s insight into the support of the Commonwealth’s interest in promoting alternative fuel and electric vehicles. Attendees were able to see alternative fuel vehicles. Dr. Marleen Troy’s Certificate in Sustainability Program at Wilkes University was highlighted as Wilkes is a RT Steering Committee member and many in our organization have participated. Dr. Troy also developed a video of past RT meetings that was played during the event. Several early supporters of the RT including our Regional Director (RD) were recognized for their vision and cohesive support. The NERO RD was specifically recognized for supporting the regional RT in 2005 when funding sources were discontinued and the RT then joined with PAEP. TYAD was presented with an Appreciation Award for hosting the anniversary event and for their numerous P2E2 projects. The Co-chairs were presented with a tree that will be planted on-site at the TYAD Environmental Department and the thoughtful gift of a forest donated in their names through the American Forest Foundation. The RT has formed a network dedicated to helping each other with environmental issues at their workplaces. They have promoted and advanced energy efficiency and environmental stewardship and have opened their doors and minds to great projects and great accomplishments! The next meeting of the RT is tentatively scheduled for November 16. Congratulations to all members on 20 years of sustainability success! perfect opportunity to ask FHWA what you’ve always wanted to know. Dinner will be buffet-style; cash bar is available. Come help us celebrate 20 years of sharing lessons learned! Register here. Please wear comfortable clothes and shoes as we will be walking for part of the tour! Pollution Prevention and Energy Efficiency Roundtable (P2E2) Meeting/Holiday Mixer at Susquehanna Brewing Company, Luzerne County. On the evening of December 14, the Pennsylvania Association of Environmental Professionals (PAEP) P2E2 Roundtable held its fourth quarterly meeting at the Susquehanna Brewing Company (SBC). The owner of the brewery is a descendent of the Stegmaier family and personally provided the one hour tour for our group. The production of beer is very energy-intensive and requires significant amounts of water, compressed air, lighting and refrigeration. According to the Brewers Association, refrigeration, packing and compressed air consume 70% of U.S. breweries’ electricity use. The SBC Pittston-based brewery is very popular in the region and has incorporated water conservation, recycling and energy efficiency practices into their process operations. SBC uses direct injection of pressurized steam at twice the speed of sound for a 3-dimensional boil. This allows for 100% of heat transfer. SBC also utilzes a heat exchanger to heat the product from 38F to 140F, a one-hundred year old brewing practice that developed to minimize the amount of wood the brewer would have to chop and coal they would need to provide to fuel the process. SBC is tuned into process efficiency, they are aware that if they can extract 10% more sugar in the process, they can decrease their raw material purchases, chemical purchases and reduce their carbon emissions. SBC is continuously looking for ways to decrease their production costs but will not sacrifice quality. In addition, Dr. Marleen Troy, Wilkes University, was presented with an award for her 20 years of service to the Roundtable. A holiday mixer hosted by the RT co-chairs followed with pizza, specialty SBC craft beverages and soft drinks. 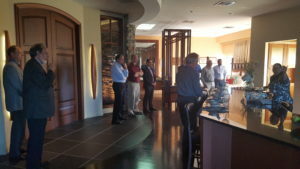 The event lasted from 4 p.m. to 7:30 p.m. and everyone had a relaxing time networking in SBC’s tasting room. Raspberry white chocolate beer was the featured holiday brew. The brewing industry is making strides in satisfying beer lovers and energy efficiency enthusiasts alike! Like peanut butter and chocolate for us environmentalists! Anyone interested in the beer making process can read more at http://blog.beeriety.com/2009/07/06/how-beer-is-made/. Also, SBC stated that they are very happy to be serving on the PA legislative committee for breweries. Register: below or email Mike Parrent lim.liamnull@vic.tnerraP.L.leahciM Use “P2/E2 meeting” in the subject line. Please wear comfortable clothes and shoes as we will be walking for part of the tour! Harsco is a company that is very committed to Environmental Sustainability and has challenged itself to drive continuous improvement in this area. The presentation will focus on Harsco’s analysis of the current state of the company’s Environmental Sustainability program and key activities that will be used to mature the overall program. In addition to the short and long term tactical actions that will be deployed across all affected sites, the strategy to mature the overall Environmental Culture of Harsco will be discussed. Harsco, Jon spent the majority of his career with Eaton Corporation, Honeywell Aerospace and Delphi Automotive Systems with multiple roles supporting EHS at the local, regional and corporate levels. Jon received his Bachelor of Science degree in Chemistry from Westminster College. Jon has also been a Certified Hazardous Materials Manager (CHMM) and a Special Government Employee (SGE) with the US OSHA as part of the Voluntary Protection Program. We are pleased to announce that the Registration is now open for our 2018 Making Environmental Connections Conference on May 1, 2018 at The Conference Center at Central Penn College in Summerdale, PA. We are excited to host many great panels and speakers this year. Click the links below for the Conference Agenda, Registration details, Membership forms and a lot of other important information. This year’s conference promises to be a great educational opportunity for our members, with such topics as ‘P3 Bridge Detours and the Plain Communities’, ‘Post Storm Event, Infrastructure, and Stream Restoration Improvements: Three Case Studies’, ‘Classic Soil Science Knowledge and Modern Environmental Practice’, to name just a few. Regulatory updates will be presented, and, for our May 3rd Luncheon and Keynote Presentation, we will have the Honorable Secretary of PennDoT, Leslie S. Richards, Jessica Shirley, PADEP; and possibly, the Honorable Secretary of PADCNR, Cindy Adams Dunn. They will speak on ‘Environmental Partnering’. Besides all of the superb educational sessions, there’s plenty of opportunity for camaraderie and networking with you fellow peers. And, lastly, a special short course educational opportunity will be available Wednesday afternoon, May 2, ‘Soil Science: An Overview of Principles, Practical Field Methodologies, and Applications’ presented by Russell L. Losco, M.A., P.G., C.P.S.S. Delaware County Community College and West Chester University. To register for this session, go to http://pcpg.org/event-2845659. A $99 registration fee is available for members of PAEP and PCPG. Non-member fee is $129. There’s still time for your firm to be a sponsor for the conference. Come join your fellow PAEP members for an opportunity to see and touch skulls, furs, hides and parts from a variety of Pennsylvania wildlife. We will learn basic identification techniques from Pennsylvania Game Commission State Game Warden Chief, Chad Eyler. Chad will teach children and adults alike how to pinpoint common species of wildlife by parts that may be found while afield. Space is limited to 50 people, so sign up now! 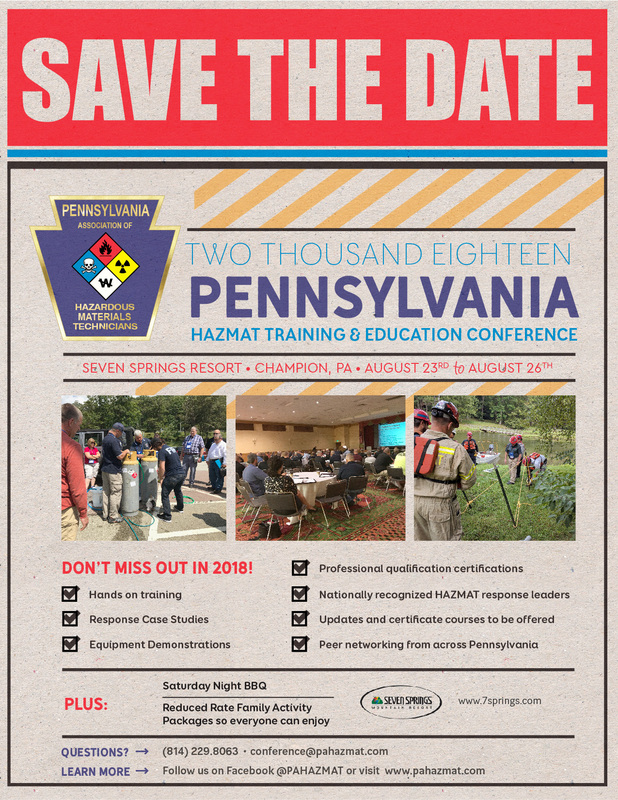 The 2018 Pennsylvania Association of Hazardous Materials Technicians Conference will be held August 23, 2018 through August 26, 2018 at the Seven Springs Mountain Resort and Conference Center at 777 Water Wheel Drive, Champion, Pennsylvania, 15622. The conference registration site is not currently open but will be soon. A link to the conference registration site will be posted on the Pennsylvania Association of Hazardous Material Technicians website at www.PAHazMat.com once available. While this conference is not sponsored by PAEP, members may still find it useful to attend. Attendees can refer to the attached brochures: ‘Save the Date‘ and ‘Attendee Information‘. Interested sponsors can find information by clicking here. Students who participate in this event will be able to attend eight demonstrations during the AM or PM session. They will listen to presentations and see demonstrations offered by various businesses and organizations related to STEM careers. Students will come away with an understanding of the exhibit’s key point. For the on-line registration form, click here. Interested businesses and organizations wishing to participate will need to complete the on-line form and submit to the email address listed. The form can also be printed and mailed, at your choice. Booth fee of $28.00 can be payed on-line or by mail-in check. Click here for the on-line registration form. 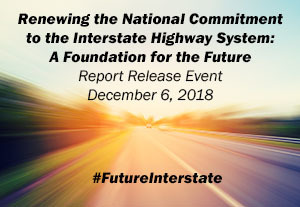 On December 6, 2018, the National Academies of Sciences, Engineering, and Medicine’s Transportation Research Board will host a public release of a consensus study report Renewing the National Commitment to the Interstate Highway System: A Foundation for the Future. The event will begin at 11 AM ET, when the report is released to the public. The event will take place in person and via webcast. We encourage TRB staff who are interested in this study to join us on the webcast. Also, please share with your networks on social media using the hashtag #FutureInterstate. Tune in at http://bit.ly/FutureInterstateWebcast – Pre-registration is not required to view the webcast. The public may register to attend the event in person. Seating is limited, so they should register to attend. For questions, contact Lisa Berardi Marflak at ude.sannull@kalfraML. PAEP will join with other professional associations for a joint Holiday Networking Social on December 19 from 5 PM to 7 PM at the Hilton Harrisburg located at 1 North 2nd Street, Harrisburg. Register at https://conta.cc/2DKwXfy for this free event. Do not register on this site. Click here for event brochure. You are also invited to register for the WTS Rotunda Series “Networking 101”. This will be held directly before the Social from 3 PM to 5 PM at the same location. Cost to WTS and partnering organizations is $30. Register at https://conta.cc/2zvgTLx. Do not register on this site. Click here for event brochure. The use of the Hydric Soil Indicators into three-parameter wetland delineations has raised the bar on understanding the role of soils in wetland determinations. However, like any advancement in scientific application, the divide between intent and application can be wide, as field practitioners struggle to comprehend the intention of the many-nuanced and often-updated hydric soil indicator definitions. In this one-day workshop, we will review the science that drives the hydric soil indicators and then put that knowledge to use in the field, where special attention will be placed on understanding the nuances of the indicator criteria. We’ll also demonstrate a new approach to monitoring reducing conditions in soils, that is both cost effective and easy to deploy. SoilHub instructors include Mike Callahan, CPSS; Gary Jellick, CPSS; Dr. John Wah; Joe Valentine; and Steve Dadio, CPSS. The cost for this course (including all materials, morning refreshments, lunch, and afternoon break) is $99 for PAEP and PCPG members and $129 for non-members. In order to register for this course (it is not included in the PAEP Conference registration fee), please complete the below form. Note: Registration cut-off date for PCPG or PAEP members is April 25, 2019. Non-member cut-off is April 23. We strictly adhere to these cut-off dates in order to adequately prepare for the course. The PAEP Annual Conference Planning Committee is pleased to announce that the 2019 Annual Conference will take place Wednesday, May 8th through Friday, May 10th at the Wyndham Garden Hotel located in State College, PA. The theme for the 2019 Annual Conference is “Growth through Collaboration”. Click here to review the program brochure and/or to access a manual registration form. Registration Fees listed below are good until midnight, April 19, 2019. A $30.00 Late Fee will be required for Member and Non-Member registrations after April 19. Select the Late Fee Ticket in addition to the event(s) you wish to attend.